Dr. Nicholas Sutfin, a postdoctoral researcher at Los Alamos National Laboratory, was the speaker of our November café. 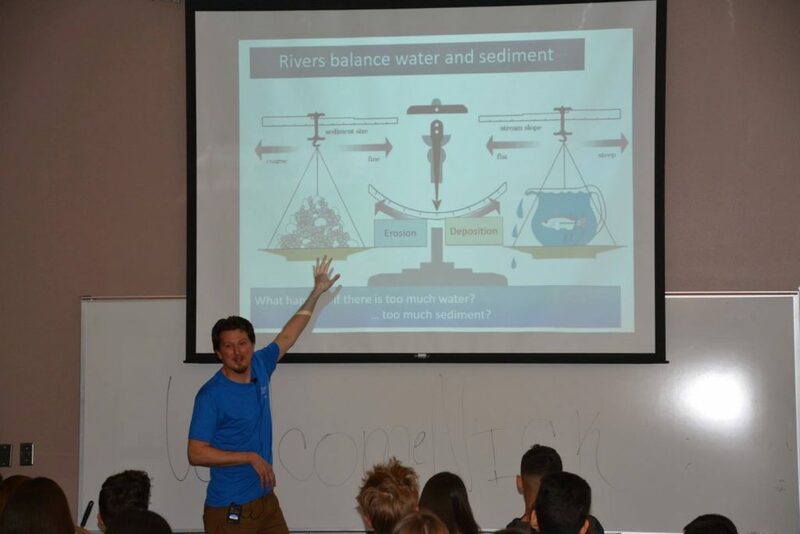 Dr. Sutfin helped us reflect on our impact on rivers, how we get water from rivers, how taking water from rivers impacts their natural flow and wildlife, and what we can do to reverse some of the damage that has been done to rivers. The speaker started with a very simple task for the audience: draw a river. Each person has a different idea about what a river is, and how humans interact with it. Rivers have a balance, not only with humans, but also with sedimentary deposition and erosion. These factors are constantly in flux in a river, and rivers have supplied resources to humans since the beginning of civilization. The next big topic the speaker discussed were dams. Dams and reservoirs store water that we can use throughout the year, and can create electricity using turbines built into the dams themselves. There are thousands of dams throughout America. But dams disrupt the migration patterns of many species of fish, not least of which includes salmon. Additionally, sediment builds up at a massive rate on the approaching side of a dam, thus rendering their ability to store water or use that built water for hydroelectric energy impossible. All of these factors have resulted in the deconstruction of dams across America for the purpose of rectifying the environmental damages caused by placing the dams in the first place. 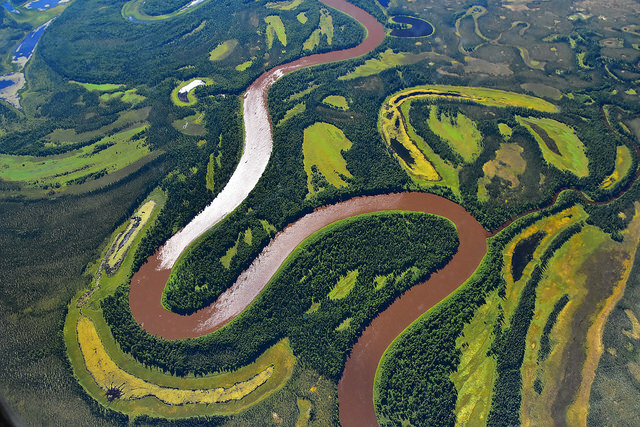 Rivers are a deceptively complex aspect of our environment, and they need to be studied so we can learn how to minimize our environmental damages on these incredible ecosystems. 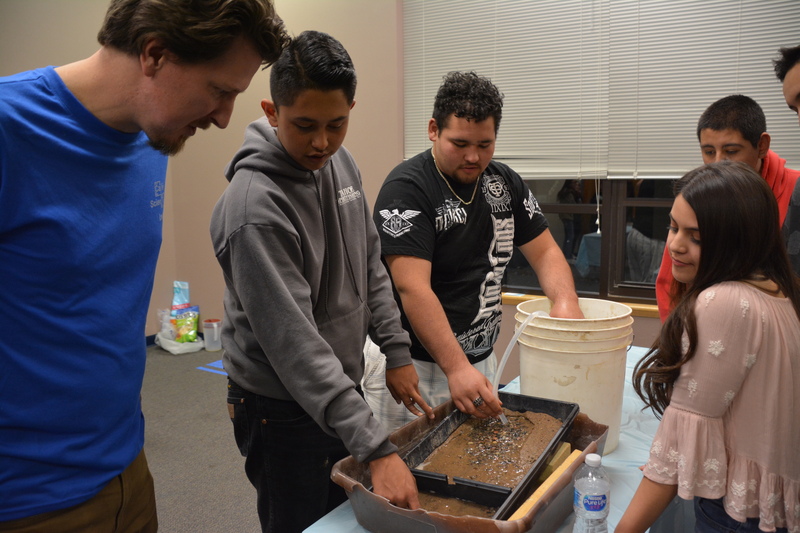 Teens at Café Scientifique in Española doing the flume activity a few night later. The speaker invited the audience to try out the flume’s set up at each table. A flume is a channel filled with a preset mixture of sediments — from sand to large gravel. We pumped some water from a bucket into a hose, and released the flowing water over the channel of sediments. We could then actively observe the effects of moving water on sediment. The reason that rivers twist and turn so much is the critical factor of roots of vegetation which create a specific channel through which water will find the path of least resistance. We can observe in these flumes without vegetation that there is very little meandering of the direction of the river.